Latest update 20 April 2017. For 2017 we plan to leave the Gold Coast a day or two after Anzac Day (25 April 2017) and sail north. The hope is to get to Lizard Island before we turn around and come back. Kelly has to go to Norfolk Island in early May and August for her role as the chair of the island's governance and audit committee. This will mean she will have to fly back to Sydney and be absent for about 7 days each time. At this time we plan to return to Sydney by early November 2017, but we could end up leaving her somewhere up north if we find the right place and price. The following is about our preparations for the trip. 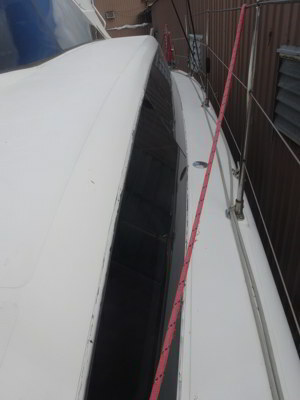 As keen readers would know, in September 2016 we sailed Catlypso from Sydney to the Gold Coast to have some work done on the windows. The windows were pulling away from the deck/hull, so they were totally removed, cleaned up and put back. This has also stopped some minor leaks we believe. 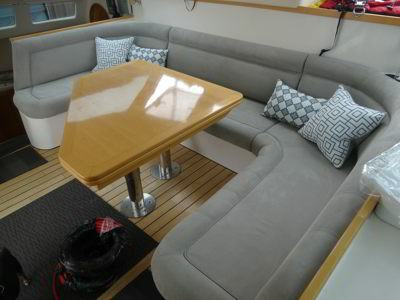 This work was carried out at Lightwave Yachts. 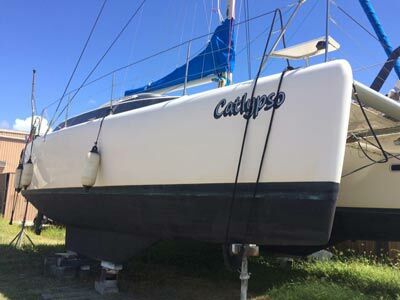 We also planned to get some other work done, but this has taken a lot longer than planned, so in the end we decided to leave her at the Gold Coast rather than sail her back home and then back up again in May 2017. 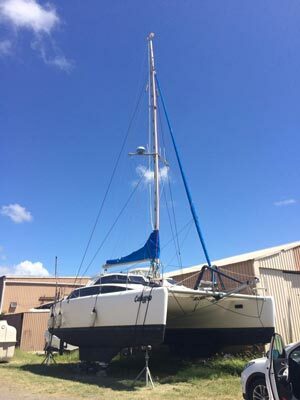 She was on the Lightwave Yacht owners' home mooring till early January 2017 when she was hauled out and placed in the builder's yard. When Kelly visited in February 2017 she reported there was not a drop of water in the boat or bilges, despite many periods of heavy rain since September 2016. Looks like all the leaks were related to the windows we had repaired (we had thought some may have been from the hatches above the queen size beds). In late March all but one was totally completed. The last one had the final touches done in late April. On the trip north the spindle broke on the thru-hull which dumps the holding tank. This was right where the handle connected. As a result, it was impossible to open the valve and dump the holding tank. To repair this, the boat has to be out of the water. When the boat was hauled out, this was replaced. The Spectre watermaker started playing up on our way home in October 2015 and once we were home Michael pickled it. We thought it was the water pump head, but that was not the case. We hope to have this problem solved once we put the boat back in the water at the end of April 2017. 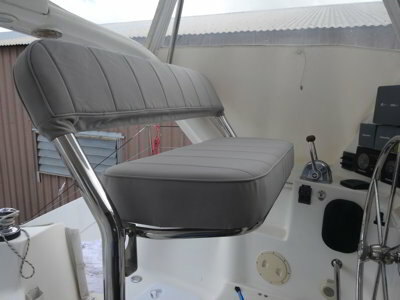 The upholstery on the lounge and the helm seat are now 13 years old and looking tired. Kelly wants to get it replaced. 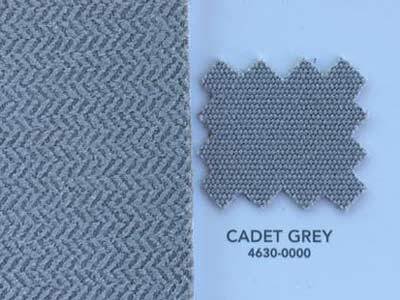 She went going up to the Gold Coast in the first full week of February 2017 and spoke to the original upholsterer about getting it replaced and also selecting new fabric. She did this and the work was finished by late March. We also did the bow berth mattresses and we got four new pillows thrown in for free. The cushions outside were also made with a join in the middle so they will fold up for easier storage inside. As well as getting a new one made with the new fabric, a repair was required. Over the course of the 2015 trip the helm seat got looser and looser. The right hand mount was loose but it was impossible to get to the bolts without removing the freezer from under the seat. To fix this, Lightwave cut a hole in the side of the step to the helm area. They then tightened it up and installed a new hatch where the hole was cut. This gives us some more storage space outside. 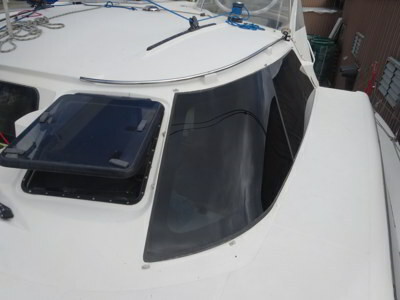 In 2015 the lower zip section that attaches to the boat for the rear shade (we have both shade and full protection) started tearing and ended up in bad condition. The upholsterer created a new one for us. The cupboard doors in the starboard cabin have been damaged by water that has over the last five years leaked in through the windows. The damage was discolouring and swelling. 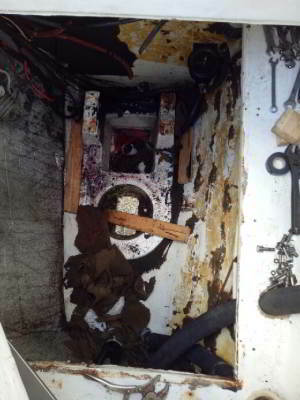 This was repaired by Lightwave Yachts. The engine rooms had insulation on each side as well as on the underside of the false floor panels. This was falling apart and pieces came off all the time, falling down into the bottom of the hull and sometimes clogging up the bilge pump. Kelly wanted to replace it but according to Lightwave, the best way was to remove the engines and then take out the insulation. I was not so keen as the cost would be considerable I imagined. I ended up being over-ruled on this and the work happened anyway. Lightwave advised that insulation is not needed on the hull sides, so we did not replace this, only on the forward wall. We also got new false floors made as the old ones were warped. These have insulation on the bottom to minimise sound and heat coming up to the upper engine room and rear cockpit area. While the engines were out, they were cleaned. Wow, what a difference! Also, it was discovered that one of the exhaust elbows from one engine was broken (a weld crack) and likely to fail again. These were both replaced with stainless steel ones. The engine mounts were also damaged (the rubber bits) and these were also replaced (very expensive). 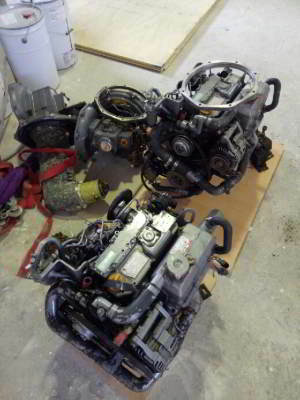 The engines after they were removed from the engine rooms A cleaned engine, how new does it look! While the engines were out of the hulls, ex-cyclone Debbie came past and dropped so much rain, the Coomera River rose a couple of metres and flooded the Lighwave factory. Thankfully, the engines had been raised off the floor where they were stored earlier in the day before the flood. The water apparently also came right up to the keels of Catlypso on the hard stand! While we had the engines out, we decided to have the fuel lines replaced as they were 13 years old and sooner or later, one was likely to split or break. Also replaced was one hose from the starboard engine to the hot water heater. Once we get to the Gold Coast in May 2017, we will need to service both engines. 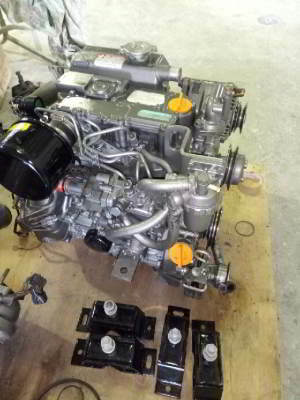 This will involve changing engine oil, oil filters and both fuel filters. The water pump impellers and the water/alternator belts that we did not change last year were changed when the engines were removed to redo the engine room insulation. 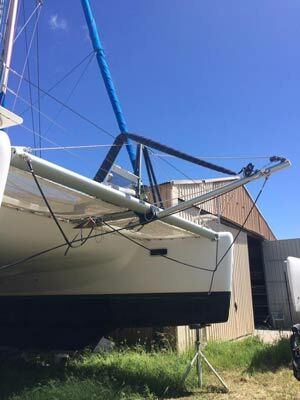 The saildrives had their oil changed in late 2015 and we have done very few hours since then, so we will not change that till later in the year. Michael purchased all the necessary items in September 2016 and it is all on the Gold Coast at Kelly's Mum's place or on the boat. The oil was found on special before Christmas and needs to be taken up with us. We had Lightwave replace the v-belts and impellers while the engines were out. As it turned out Michael could have done it when we went up in late April as the engines still had not been reinstalled. He also replaced the four fuel filters while the engines were out and will do the engine oil and oil filters once we are back in the water. The bow sprit is supposed to be able to be retracted. However, it has never worked and we could not pull it back when we wanted to. We had this fixed. This was important as when we are in some marinas, it sticks out over the marina, meaning we need to tie the boat back further (we prefer to go in bow first). We have always had problems with the anchor light and the lower navigation lights. Michael got the nav lights going in 2015 before we left on our first trip but they have always been problematic. The anchor light worked about 10% of the time before Michael was finally able to get it working after about a month into that trip. However, his repair was fairly bodgy but it worked for the whole trip. 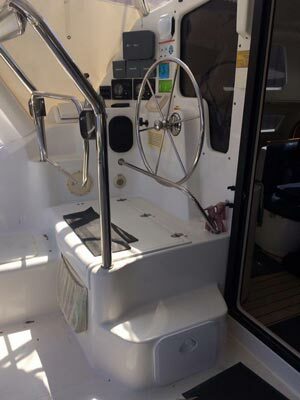 When we took the boat to the Gold Coast in September 2016 the anchor light did not work at all and the nav lights were also not working (the ones at the top of the mast were). These were replaced in late April. Our friend Paul repaired our wind generator again after it failed in August 2015. 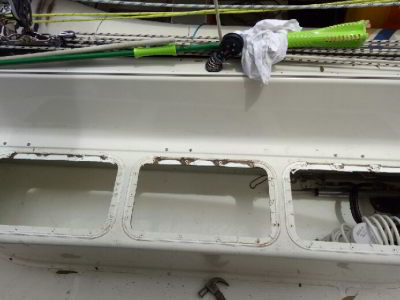 You may recall that after one of the blades broke off in 30+ knot winds, we replaced them with new ones. Soon after the generator stopped working. It turns out that the electronics controller board failed and all the switching FETs (field-effect transistors) destroyed. Paul replaced these and the controller with an external unit. We have this back now and when we go back, we will need to install the generator back on the pole (with the blades) and put the external controller inside the upper starboard engine room. This should not be a hard task. The thermostat failed in August 2015 and was removed and the 240 volt cables disconnected. 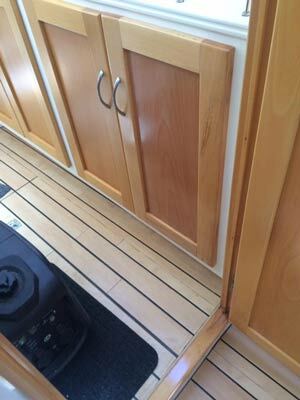 We hope to reinstall the cabling so that we can heat the water using the generator (we do not need the thermostat as we will never run on shore based 240 volt power). The rear seat has three hatches in the top. They have leaked since we purchased the boat in 2014. Basically they are either broken or poorly sealed. In addition, a couple have broken hinges. They leak for a number of reasons we think, including a poor design which lets water pool up and when you open the hatch, it falls inside. These were replaced with a new design that should stop this as well as fix the other leaks. This way we have a drier storage area (currently everything in there ends up wet or damp). 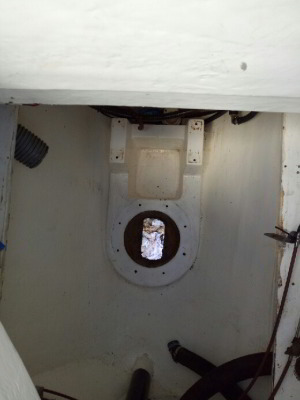 We also replaced the gas locker hatch as this was broken. When we were at Magnetic Island in 2015 we saw a Lightwave come in which had broken her steering cable. We decided we should check ours and as a result, we have got a new cable. 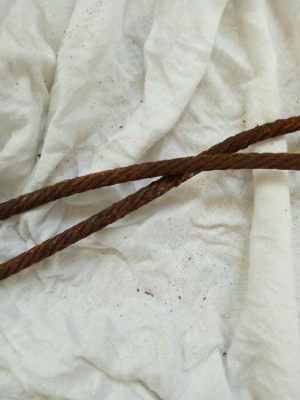 It was very rusty as you can see from the photo below. We purchased two kayaks for our Christmas 2016 presents. We will need to transport these to the Gold Coast. Luckily, our friends Marina and Geoff from Island Home who we met in 2015 are driving from Perth to the Gold Coast via Sydney in March 2017 and offered to take anything up for us in their trailer. We met Geoff at Lightwave and transferred them into Lightwave's factory. We will then need to work our where to store them on the boat, probably one on each side towards the bow. The hulls were still in very good condition when we hauled her out in January 2017. This was 15 months after we anti-fouled her in October 2015. However, as she has been out of the water now for more than a few days, we will need to redo before we put her back in the water. We plan to do a full jump (three coats) so we will not have to do again till we come back to the Gold Coast in May 2018. The props were coated with Prop Speed in October 2015. As we expected, this has not lasted well and we will get it redone before we leave in May 2017. 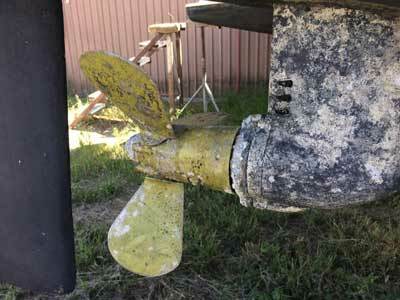 The saildrives are also in very poor condition, despite the eight coats of anti-foul we put on them. We will also need to replace the skirts around the saildrives as they broke when they were removed. 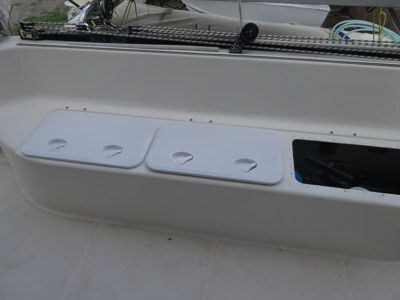 This is above the rear cockpit and purely there to let air into this area when sailing or at rest. The glass in this has totally crazed, so we will replace the hatch. We also replaced the inside surrounds to some of the other hatches as they were in poor condition. 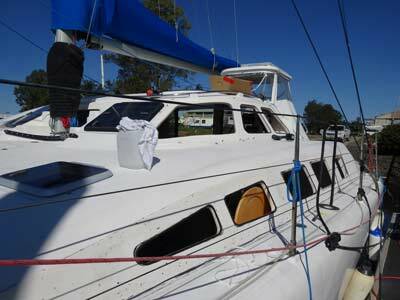 As we sailed Catlypso from Sydney to the Gold Coast last year, the hatch latch broke. This has been replaced (we tried to buy last year but was out of stock in Australia and not available for 6 weeks). Lightwave had a suitable one and replaced it. Well, this is really annoying. When on the hardstand at Lightwave, someone stole our beloved Mercury 15 hp outboard! Kelly noticed it was not there when she visited but never mentioned it to Lightwave, assuming they had removed. However, back in Sydney she phoned them and discovered it had been stolen. We know within a few days when it was taken and apparently another outboard was stolen around the same time. Insurance actually paid us more than I expected, but we thought we may have needed to pay more to get another one. I looked at getting a 20 hp but they are considerably heavier than the 15 hp, so stuck to the 15 hp. We only looked at Yamaha and Mercury. There were quite a few for sale on eBay and Gumtree, including quite a few between Sydney and Brisbane. We found one for sale at Grafton on the North Coast. When we drove up in late March we looked at it. It was in very good condition and we purchased it and took it to Kelly's Mum's place. We will install it a day before we leave in late April. We need to pull our dive compressor apart (take off the electric motor) and transport it and the petrol motor to the Gold Coast together with consumables (filter and oil etc). We will reassemble it on the boat as this makes it much easier to lift etc. Michael took up the stainless steel container for it back in mid-September when he drove up there. We will also take all our dive gear as well as extra spares. The three tanks are already at Kelly's Mum's place on the Gold Coast. We took up the petrol motor and the parts we need to change as well as the hoses and oil/water catching containers when we went up in late April. We have purchased a few new things we need to take up with us. This includes a portable depth sounder for the dinghy (so we can find water depth before anchoring for diving), a man-over-board Nautilus device (which transmits on AIS and VHF DSC). This will be used for diving as well as for use by whoever is at the helm at night. We have purchased some batteries for the various items on the boat that use them. This includes AA, AAA and other specialised batteries. We will need to replace all the batteries in our life-jacket strobes, our torches and some other items. If any of these batteries are still okay we will use them in other non-critical applications. Once we go up to get back on the boat, we will purchase all the necessary food to last at least one month. We will fill the two freezers as well as the fridge and all the food compartments. We have started a list of things already. We need to top up the main fuel tank and fill the five diesel jerry cans. We will do this closer to leaving. We also need to fill the dingy's fuel tank (petrol and 2 stroke), the small fuel containers and the larger jerry cans (petrol). Click here for the first part of our 2017 trip.